CAREER HIGHLIGHTS: Jason has performed onstage with a wide variety of professional artists including Broadway Stars Jeff Kready and Nikki Renee Daniels, KANSAS, Sandy Hackett's Rat Pack Show, Nelly's Echo, Linda Maxey, Bob Becker, Topeka Symphony Orchestra, Topeka Festival Singers, and Fountain City Brass Band. He also has over 50 musical productions on his resume, and the number continues to grow. BIOGRAPHY: Jason Degenhardt holds a B.A. in Music Education from Washburn University in Topeka, KS. During his time at WU, he performed in various ensembles which included performance tours of Honduras and China, as well as a live film recording with the band KANSAS, and various appearances at the Kansas Music Educator's Association State Convention. As a performer, Jason can regularly be found in the pit for musicals at the local theaters, and onstage with groups such as the Topeka Festival Singers, Invisible Bike, The Blue Notes Variety Band and more. 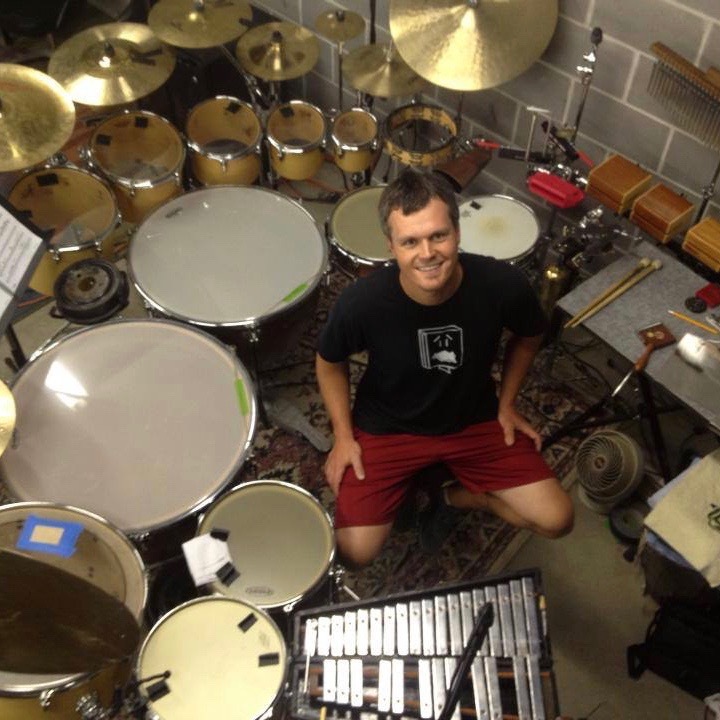 As a teacher, Jason has a private percussion studio where he teaches snare drum, drumset, and mallets to students of various ages. Numerous students of Jason's studio have achieved high honors at state competitions. When he's not teaching and playing, you can find Jason in the "Drumgeon" building TreeHouse Drums with Derek Sharp. Jason's mix-n-match set. He started with the three drums in the photos, and has added from there. Now when it's gig time, he grabs the sizes he needs for that application and hits the road! See more photos of the original 3-piece kit, Wee Blue Bop. See more photos the solid shell snare, Big Blue. See more photos of this snare. A great mid tone snare to fill out a kit or add different voices to a musical. Jason had his friend Sara Myer provide the custom paint job on this 2&4 beast. This drums sounds even better than it looks. Gorgeous drum. This snare lives in Jason's private lesson studio. The shallow depths allow for Jason to cram this kit in the corner of a crowded theater, and the drums still sound big enough for the concert stage. See more photos of this kit.